Left-Hook Lounge Mailbag: Canelo vs Lara - The Fight, The Score Cards, The Aftermath!!! Casey H. (Los Angeles, CA): I saw your Facebook post about the score cards and don’t necessarily agree, but I can respect that there’s a lot of depth to your points. Can you elaborate on how you scored the fight the way you did and why? Vivek W. (ESB): I think the easiest way to address this question is to point out the fact that fans must realize one simple truth: The way we judge fights as fans is NOT the criteria in which judges are asked to judge fights professionally. If it were that easy, there would be no basic and/or extended requirements to do so. When we judge fights on a fan level, we look for guys landing, giving and taking, and basically the typical stuff. A judges job is far more in-depth and it requires a totally different mental approach, as there are three major things they have to account for, wherein the typical everyday fan is only looking for one (who’s getting hit the most). Each judge is ordered to assess (3) things: Who presses the action? Who controls the tempo? And finally, who lands the cleaner, more effective shots. So my question to anyone reading is this: Can you unequivocally say that Lara did all three of those things, moreso than Canelo in at least 7 or more rounds? In the first 3 rounds, he pressed the action and had Canelo backing up, and he controlled the tempo by landing, even when stepping back or out of the way; but the stats tell us, as much as it seemed the opposite, he failed to land more of the cleaner punches in those rounds, which already cast doubt on the very rounds many felt he won without a question….but we’ll get back to that in a bit. After round three, we saw heavy exchanges where he would land a few quick shots, but spend far more time escaping harms way, and when he attempted to escape, he failed to throw punches in return. It takes me back to a conversation with Floyd Mayweather Sr. back in 2007. He mentioned something that I never totally understood until I learned what it is specifically that judges look for. Basically, he said, (paraphrased), “defense can make or break you on the score cards. The average fan only views landed punches as a way to win a round; but what they don’t know is that effective defense is a quicker way to win a round because it rates higher than effective offense”. He then clarified, (paraphrased), “if you make a guy miss, and you land frequently when they miss, you get credit by the judges for using that defense and implementing offense. But if you’re on the move and you’re not letting your hands go, it can actually work against you, because now you’re just wasting time”. He concluded his point by saying “judges are there to judge a fight, so even with defense, you have to fight. If you don’t, you’re basically forfeiting your round to the man trying to (fight) in the mind of the judges scoring the contest, whether he connects more or not”. When you think about those words and consider the way he trained his son, (‘Money’ Mayweather), it explains not only why, but also how he has been able to find such success. Compare their stats against Canelo and this point shines like jewelry! Mayweather threw 505 punches and landed 232, holding Canelo to 22% connect rate. Lara threw 119 fewer punches than FMW, yet allowed a 23% connect rate. Another irony in the numbers is that many felt Lara landed the cleaner shots, yet in 10 of 12rds, Canelo actually landed more power shots (which judges view as the more effective). Yes….10 of 12 rounds! That’s as unequivocal as it gets! We’ve now seen fours sets of judges in four fights that left Lara feeling “robbed”. Two of which he loss, and two of which were a draw. In each, he simply failed at this one thing and it cost him in the end. Had he used offense when implementing defense, he’d probably be undefeated because he would have won several of those close rounds and potentially each of those fights. So, this is what fans need to understand. It’s not about who landed more. That helps. But the judges are asked to view other things that carry parallel weight. Bottom line, the best way to understand these “crazy” judge scoring cards is to understand what they’re looking for. We routinely see one really far out card, which leads me to believe that each judge could be asked to judge one of those particular things a piece (in example: one judge look for “controlling tempo”, one judge look for “cleaner shots landed”, and one judge look for “who presses the action”). Whatever the deal is, fans have to realize that one fighter must do more of each of those (3) things in every round than his opponent did to win that round……or achieve a knockdown. Anything less fails the test! Taiji B. (Chicago, IL): I thought Lara fought a very good fight, but his inactivity hurt him in the end. How would you assess the performances of both men? Coming into the fight, my biggest question about Lara was whether or not he would seize the moment and keep his pedal to the medal in a fight of this magnitude. I don’t think he was nervous, and I don’t think he was overwhelmed. In the end, the only reason he loss was the only reason he failed to earn victory 3 other times in his career, and that was a failure to understand that he can’t leave it to the judges. People said he was “robbed” against Paul Williams, and even then, I was in the minority that felt he simply didn’t assert himself during key stretches as much as he needed to win. This was the same case. I don’t know what it will take to get him to understand, but he just loss the biggest match to be made for him, so the future isn’t as bright – at least not monetarily. I’d rate his performance a 8 of 10. Relative to Canelo’s night, I think he put together as good of an effort as possible, considering that he had a man in front of him that failed to engage. People wonder how the judges could have given him credit for some of those rounds, and I have to remind them that the judges also follow the sport and often consider angles we may not. Perfect example: these judges know that Canelo throws (on average) 700-800 punches per fight, or more; yet in this case, he was only able to throw 415 against a man who threw even less (386). If a busier fighter has his numbers tempered by a man who threw less and engaged less, how can credit be withheld, whether he’s landing or not? 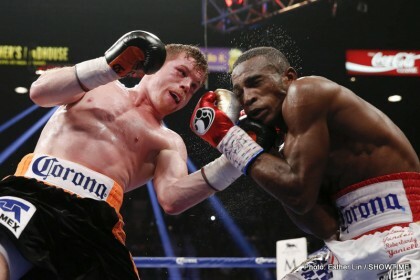 So, Canelo did the best he could under the circumstances. I’d also rate his performance at about an 8 of 10. Vince R. (Ocho Rios): There’s a few fights I would like to see both of these guys in, personally, but what fights do you think we’ll actually get from them next? Vivek W. (ESB): It’s really tough to say. I know Arum and Oscar De la Hoya have openly spoken about the idea of Cotto and Canelo mixing it up, but Arum seems intent on doing that one on Cinco de Mayo of ’15, if for no reason other than the possibility of being able to finally wrestle the Mexican holiday away from Mayweather. If they have the discipline to hold off that long, it’ll be interesting to see what Canelo does in the interim. GGG could be a December possibility. Highly unlikely if a Cinco de Mayo clash with Cotto is truly on the table, but Canelo is making it clear that there are no tune-up bouts for him, so it’ll be interesting to see if they pull the trigger on that one, as there are no other marquee matchups to be made at this point. Right now, Lara has put himself in an awkward position. He’s a “dark horse”, so those men at the brink of reaching the elite class where the real money starts may opt out of a potential shot at him (Demetrius Andrade, Charlo, etc). With that being the case, where does he go for decent money making opportunities? I don’t think he has true options, here. We’ll have to wait and see, but his options are slim. Perhaps a rematch with Canelo can happen? Stay tuned. You are here: Home / Boxing News / Left-Hook Lounge Mailbag: Canelo vs Lara – The Fight, The Score Cards, The Aftermath!! !